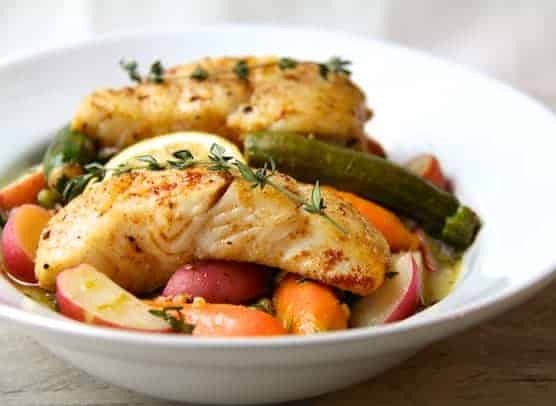 Butter-Basted Halibut with Lemon-Braised Baby Vegetables is perfect for a spring dinner for two…. Or just for the halibut! Who doesn’t love halibut? Who couldn’t love halibut basted in butter? 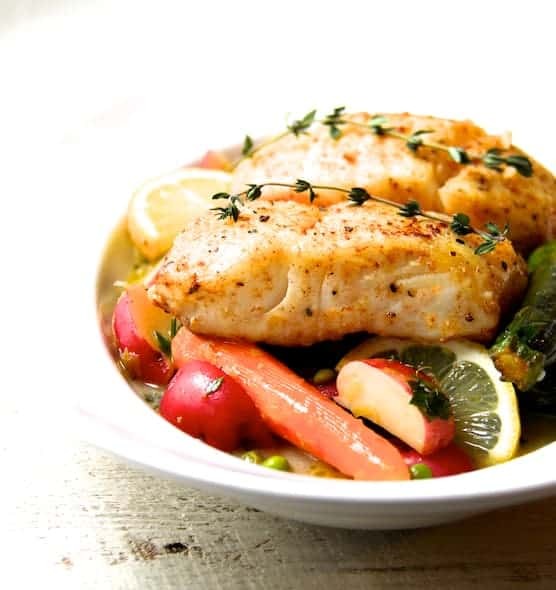 Halibut has a mild, sweet flavor that lends itself well to almost any preparation. When buying it, look for Pacific or Alaskan halibut. It’s carefully regulated and one of the most sustainable seafood choices available, according to the Monterey Bay Aquarium’s Seafood Watch program. This preparation uses a butter-basting (also called pan-basting) method to cook the fillets on the stove top. You may wonder why anyone would want to take something so healthful like fish and then bathe it in butter. The browned butter adds a wonderful nutty flavor and prevents the fish from drying out. If you want, you don’t even have to flip the fish; the butter will help brown and crisp the side facing up. If you don’t want butter in the finished dish, leave it behind in the pan and drain the fish briefly on a paper towel. Halibut is on the pricey side, so feel free to substitute another mild white fish such as cod. Baby vegetables are located in the specialty or cut vegetable section of area markets. This dish uses baby carrots, which are young carrots with about an inch of the green still attached. In contrast but more widely available, baby “cut” carrots are mature carrots that have been peeled and whittled into a baton shape. If you have a garden, pick some of the produce at the “baby” stage for this dish. Baby pattypan or yellow squash can be substituted for the zucchini or baby lima beans instead of the peas. You could also use baby artichokes in place of the potatoes. If you can’t find baby vegetables, use regular-sized vegetables and cut into similar-sized pieces. Was the liquid supposed to evaporate/soak into veg or should there be a lot left? It’s really good!! Hi, Laurie, It shouldn’t be dry (evaporated) or terribly soupy–just a nice amount of liquid left. Although there’s some butter involved, it’s a lighter dish. How did it turn out for you? And by the way… thank you!